Invest in youth finding meaning in service! This generation is at the crossroads of multifold interconnected crises - one, ecological crisis that is threatening life on Earth; social crisis with rising economic & political inequity and most importantly, spiritual crisis with alienation from one's own self and dismantling cultural roots. So how the young generation conducts itself over the next 50 years will define the future of humanity on the planet. Too large to think about? Youth Alliance, an 8 year old youth ecosystem is humbly striving to raise inner consciousness in young people to respond to these crises with courage, service and audacious imagination. The key focus is to shift their paradigm from consumption to contribution, isolated self-interest to community cooperation and from blaming to serving. In the new techno-reality that our world is more and more living into - Youth Alliance is keeping alive faculties that make us human. Youth Alliance s nurturing a community of empathetic leaders who apply their head, heart and hands to understand the world serve the world making it more equitable, cooperative and sustainable. 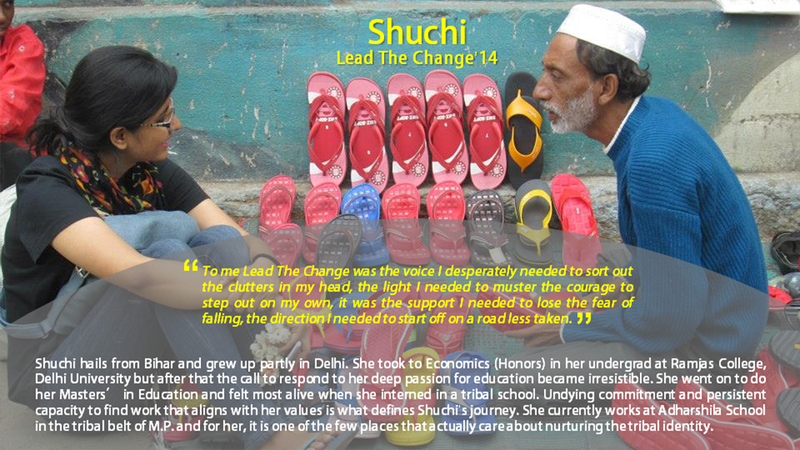 We do this through ethical leadership and experiential learning programs for young people across India, designed to facilitate them to explore themselves, connect with their purpose and build a life and career in social change and across sectors. In last eight years we have worked closely with around 620 youngsters through our core programs emerging into 37 social enterprises, 280+ joining different development organizations and many more active volunteers. Journeys that facilitate and enable young people to immerse in a social reality, build a fuller understanding through empathy and inspire them to create a personal road-map in the path of service in their chosen field. We have done 22 journeys namely, Gramya Manthan, EarthShastra and ONUS. 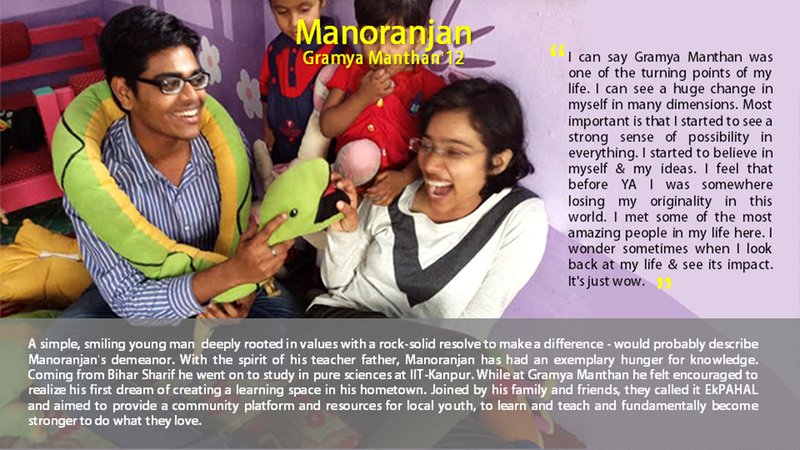 Watch Gramya Manthan film here. To sustain and support the journeys of our alumni and create a community of cross-pollination, we create several reflective spaces throughout the year. These are themed and contextualized based on needs of the community like Samvaad, Walking Pilgrimage, Personal Transformation, Action Learning Days etc. These program help facilitate individuals in social change organizations connect deeply to their purpose, build their capacity for work, strengthen relationships within teams, deepen the focus on values they stand for and get better at affecting change in their communities. We have worked with organizations in Chattisgarh, Bihar, Uttarakhand etc. Where will we utilize the financial capital? I would like a tax exemption receipt. 3 29-Mar-2019 Anonymous 5000 Good work buddies. Love the way you work for the society. 4 29-Mar-2019 Anonymous 1000 More strength to the the small circles where hope lies! 6 29-Mar-2019 Anonymous 2000 All the best to this wonderful organisation for touching so many llives with your love & joy! 7 28-Mar-2019 Anonymous 2500 I appreciate this initiative. Congrats and all the very best. 9 27-Mar-2019 Shrikant Nair 5000 All the best. 11 19-Mar-2019 Anonymous 37638 2.7 it is. HBD. FYATTO. 13 19-Mar-2019 Anonymous 1111 A small token of love for Vibhuti and YA Team. May you all continue to rise and shine. 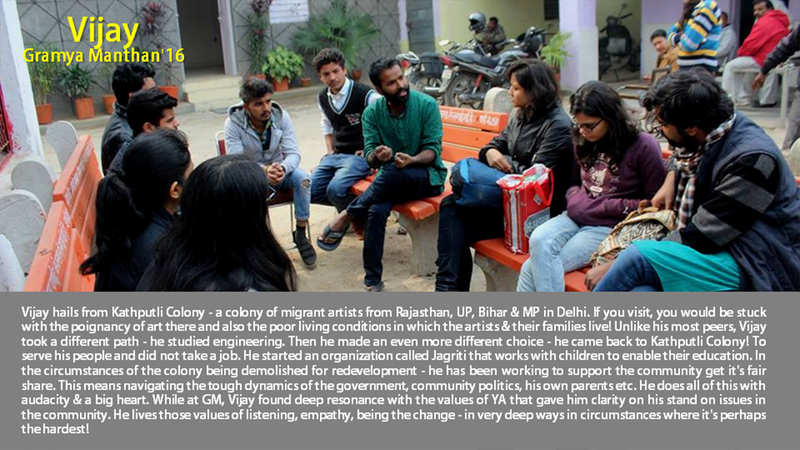 14 19-Mar-2019 Swapnil Kant Dixit 10000 May the youth lead! 19 13-Mar-2019 Rabish 3210 Lage raho bahua! 20 12-Mar-2019 Anonymous 350 More power to you. 21 10-Mar-2019 Anonymous 1000 Efforts are on. Look forward to do more! 22 08-Mar-2019 Anonymous 10000 Trust YA to build leadership from within for a post modern world. Good going. 27 04-Mar-2019 Anonymous 10000 Keep going stronger and stronger! 29 02-Mar-2019 Anonymous 1234 Keep up the work to impact the intersubjective ways in which people experience and create reality. 30 27-Feb-2019 Anonymous 10000 All the best!! 34 22-Feb-2019 Anonymous 500 Keep the good work up team! 37 21-Feb-2019 Anonymous 1000 . 39 20-Feb-2019 Anonymous 500 Service to mankind is service to God. 41 18-Feb-2019 Anonymous 1000 I believe in YA and Srishti Shrimali. God bless you all. 45 16-Feb-2019 Anonymous 15000 Just a small contribution from my side. Keep doing the great work and inspiring others. 47 16-Feb-2019 Anonymous 1000 . 50 16-Feb-2019 Anonymous 10000 Kudos to the team! Keep up the great work. 56 05-Feb-2019 Anonymous 15000 Great work. Keep it going. 62 29-Jan-2019 Anonymous 10000 Over the years I have come to believe that it is in small acts of love that we can change ourselves and the world. Thank you Youth Alliance for being so authentic and caring for many of us. Please note that transactions made on this page are donations. Kindly contact support@rangde.org if you have any queries.